I just can't stay away from the new Graphic 45 papers! I made another book with it this weekend. I really must say I love this one! It is very simple but the papers and the style just make me happy. And that is what being creative is all about, right? It's just a fun little hardbound accordion book, with several fold outs and hidden spaces. If you click on the photo you can see all of the pages and details. I hope you all enjoyed your weekend and did something that made you smile! The Graphic 45 albums are both finished! I just love this paper and it is just so much fun to create with. If you haven't gotten any for yourself you need to! So here are the two books I made. . . 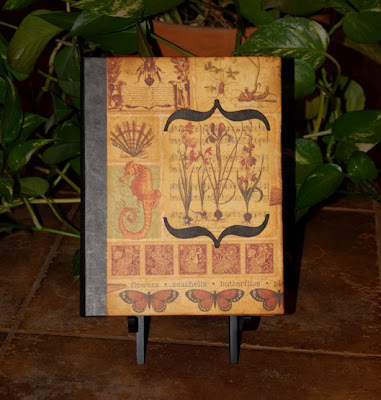 The inspiration for this book was the old style specimen books and botanical sketch books. There are 5 different sections to the book, each divided with a black half page and botanical tag. There are a couple of envelopes throughout the book as well as lots of ink, stamping and tearing. I wanted a really earthy look to this book so I made it so that the pages slightly overhang the edge of the book covers. I came up with a new way to use the Bind It All machine to bind this album together that I am very pleased with. You can click on the photo to see the rest of the book. I made this book to house some photos I plan on taking in California in a couple of weeks. I love to take photos of the plants and the beach there and wanted an album just for them - no people in this book. There are 14 full pages (7x6.25) and 2 half pages in this book. I used the bind it all to bind the pages together but did an unexpected top flip to the pages instead. The inside cover was left plain so that I could add photos and tags to it once I get ready to fill it. 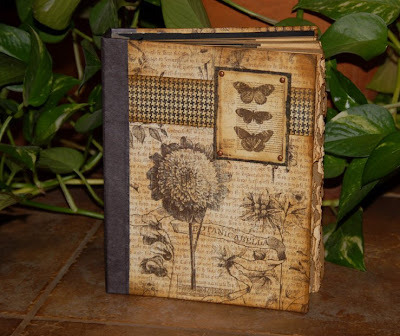 There is a small acordian book on one of the beach pages that will be used for journaling. I can't waint to fill it up! You can click on this photo too so that you can see all of the pages. Thanks for taking a peek at my latest creations - have a GREAT weekend!!!!! I was run out of my own house today! That's right - Found a scorpion in my house today (AFTER it stung Zsa Zsa!). I HATE those damned things so much!!!!!! And they really scare me. So, as soon as Monkey woke up from her nap we headed out. 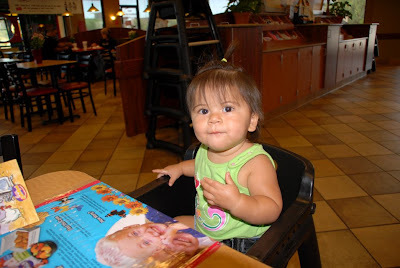 I took her to Chick Fil A for lunch. This is Bryanna, lizzy and my favorite fast food place. And today was Monkey's first time! She loved it. Today was full of firsts for Monkey - Today was her 1t time to get to play with balloons! Her Mommy is terrified of them. But she wasn't - she loved playing with it. 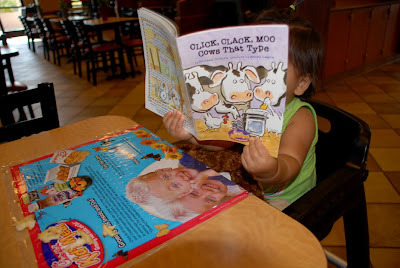 She even took the time to read stories to her monkey "Penny" from the book she got in her kids meal. Other than the icky scorpion it was a GREAT day today!!!! I told you all on Friday night - I was going to lock myself away in my studio this weekend and play with my new Graphic 45 papers - and that's exactly what I did!!!! Infact Friday night I got started and by Saturday evening I had a book made and I really like it! I have not gotten any photos of it yet because I started another one!!!! I am about half way done with No 2. As soon as I finish I will get photos taken and post them. I have Monkey here all day today and she is not a happy camper today - teething really bad - so I probably wont get to work on it today. But maybe if she takes a nice nap today I can get a little bit done? I hope you all had a great weekend and got to create something for yourself - a book, a great photo or maybe a special memory? SMILE - and I will see you later! The Creative Quest This Weekend! Because the new Graphic 45 paper collections are in the store!!!!! That's right, both collections and I know I just bought 45 sheets of it myself today! So it wont last long and you will deffinately want to get some of this paper. I have a million things on my "TO-DO" list right now, but all I can think of is playing with that paper. Stay Tuned - it might tuurn into a class that you will want to take. I hope you all have GREAT plans for the weekend - I know I am doing a little party shopping with Bryanna for Monkey's birthday party on Saturday. But other than that I think I will be locked away in my studio playing! Might as well as hot and sticky as it is here! What ever you do have fun and take your camera with you! PS: the sample book for the "RED" class is at the store now if you want to see it. Hey everyone - I'm back!!!! We actually stayed an extra day. Boy was it nice to get out of the heat! So here are the highlights of my trip. . .
we traveled - I was so restless in the car this time! We got to the hotel and then took off for a drive and then out to dinner. Not one photo was taken this whole day - can you believe that! We shopped!!!! We spent most of the day at Seaport Village. We just adore all of the shops there. We also enjoy the people that set up their tents and "peddle their talents". 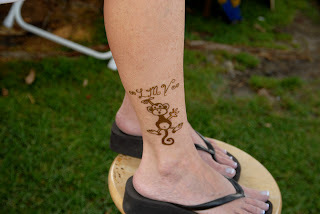 I ended up on a stool getting a henna tatoo. . . of my Monkey of course! Then we took a pedi-taxi down to the Maritime Museum. 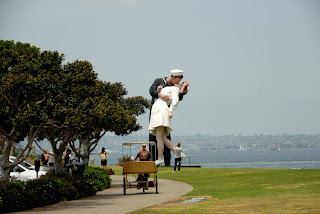 They had adden this great statue of "The Kiss" from WWII. It was so beautiful and so tall! Gary is a big guy, but look at him next to her shoe! 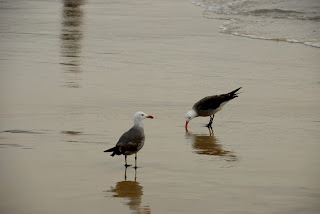 We also headed over to Coronado Island and did a little shopping. I found a little shop called Seaside Paperie and Gary was nice enough to go in and spend some time. Of course I came home with some new paper! I found another little shop called Baby Me Forever - WOW!!!!! If I didn't live on a budget I would have done some serious shopping there for Monkey! I forgot to mention that when I packed Gary's clothes for the trip I paked all the shorts he had that had NO buttons! So, on thursday when we shopped we headed to the mall and bought him the cheapest shorts we found at this upscale mall ($56!). This morning's 1st adventure was to the casino and outlet mall. We actually won a little money and ended up buying Gary a whole new wardrobe for under $200! That's right - 3 pairs of slacks, 4 pairs of shorts, 7 golf shirts and a belt. After this Gary let me pick where we went next. 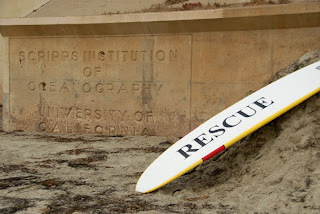 I chose Scripps Institute. Those of you that know me, know why this place is so special. But for awhile it looked as though we wouldn't ever get there. We kept getting lost and Gary was getting very frustrated! I love the pier there and really wanted to shoot it. Finally we found our way there and I was thrilled! Sadly I overexposed 90% of my photos while we were there. I just couldn't get the light right. It was so overcast and the sky was full of smoke from the fires. The glare was terrible and made even looking at the screen on my camera impossible. This actually became an on-going problem for the whole trip. 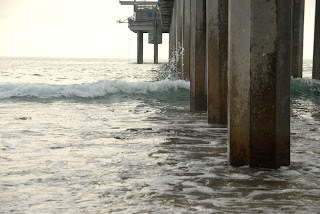 But here are a couple of photos from Scripps. . .
We LOVE to go to the Koby Swap Mart at the Sports Arena in San Diego everytime we vacation there. We usually go on the last day of our trip but not this time. We were there for a couple of hours and all of a sudden I was spent! I couldn't even think! Back to the hotel for a much needed nap! After an hour or so Gary woke me and we headed off to the beach at Coronado. I have to admit I was not thrilled. I was starting a migraine and I was grouchy! 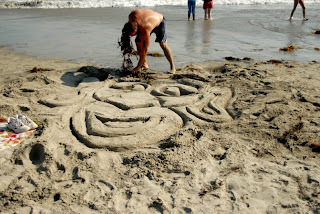 Gary played in the surf and made a sand sculpture (which drew a lot of attention) while I "napped" on the beach. As soon as he finished it, the surf came in and washed it away. 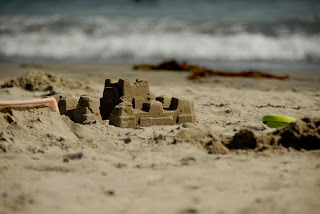 The little kids next to us had made this little castle and I just thought it was so sweet. We got food and back to the hotel early tonight. I was so glad of that - I really felt awful! But nothing a good night's sleep wouldn't cure! The last day of a vacation is always kinda sad. You gotta get everything packed and try to fit in the last few things you wanted to do. I wanted to go to another one of my "special" places. 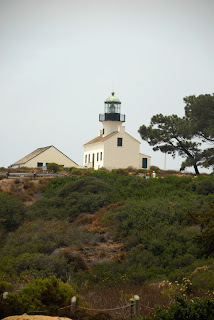 . . Point Loma Lighthouse. I have the greatest Husband and he took me there. But on our way we stopped off at the Sunset Cliffs. I do not know why we had never stopped here before - it was amazing! I took a ton of (overexposed) photos here, but handed off the camera for a bit so that I could explore the edge (NOT a camera friendly place) and Gary captured about 30 of these pictures of me. After the Cliffs we headed over to my lighthouse! I just love this place, and I was lucky today that hardly anyone was here. I was not fighting the other tourists as I took pictures. 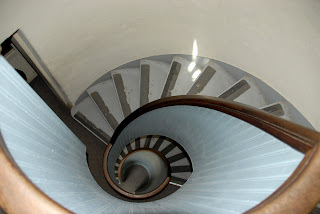 Look at how cool the staircase is inside the lighthouse! 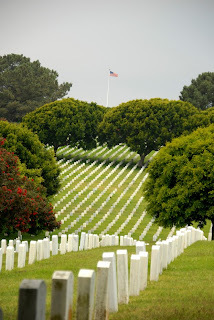 This is the Veterans Cemetary that flanks you on both sides of the road as you head up to the lighthouse. Well, after Point Loma we headed out of San Diego to come home. But not without letting Gary stop off at the casino again! He didn't walk out a winner this time - oh well - we still had fun! 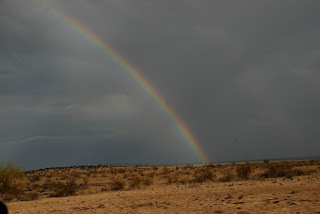 As we started off across the desert we got the show of a lifetime in the sky! I was dying because my camera was in the trunk!!!!! All of a sudden Gary just pulled off onto the shoulder and told me to "get out"! What was wrong? I just couldn't figure it out. He was being nice and allowing me to get my camera! So the rest of the ride home I was shooting out the windows and the sunroof. We say 5 different rainbows on our way home, and got treated to the best sunset ever!!!!! 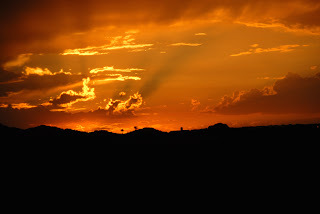 The sunset picture I did not take through the windows - Gary is so sweet and pulled over once again for me! He is so paitient with me and my camera! So, there's the highlights of my trip. How was your week while I was away? Did you have better luck with your camera this week? Coming & Going. 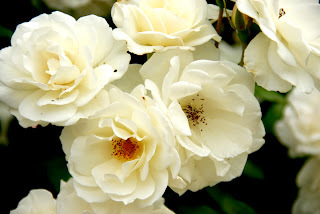 . .
Hello - Just wanted to say bye before I leave. 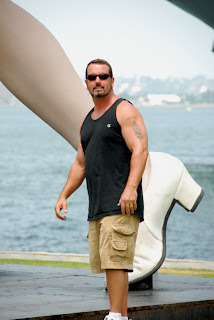 . .
Gary and I are heading to the beach in the morning! I am so excited to get out of this heat for a few days. We decided this weekend to take a quick trip to San Diego, our 1st vacation since Bryanna got married! Well, it's almost time for CHA Summer releases. This is always a fun and expensive time of the year!!!! Lots of the manufacturers are starting their product previews, and one of them have really grabbed my attention!!!! You gotta take a look at this stuff - it is VERY Marta-licious! Just had to share that with all of you - doesn't it just make you want to create something???? Speaking of creating something. . . 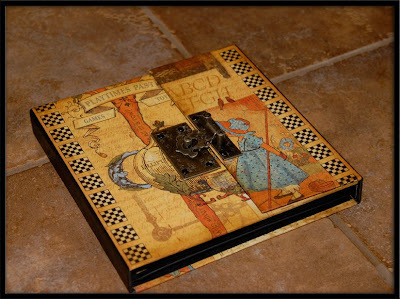 I wanted to show you one of the upcoming projects I will be teaching at The Creative Quest in August. It is a fun little purse album. Lots of lace and femininity in this one, with a little vintage feel to it. There are 16 (32 front & back) black pages seperated by 4 white, scalloped pages sta,ped with such headings as Memories, Together, Happiness & Time Flies. You wont want to miss ths class so sign up soon - there will only be 10 spots available. I also wanted to share a new website I found today with you. You all know I love things with a vintage flare - and this is a very cool site for all of those kinds of things. I was hoping it was a brick and mortar store that I could visit, but when I called I found it was only an online store. 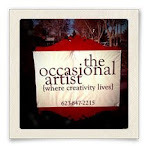 But the owner was delightful on the phone and knows and loves our ladies at The creative Quest! 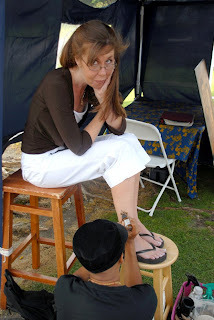 So if you have time take a peek around her site - I think you will enjoy it. So, does anyone have any big plans for the holiday weekend? Gary and I are still unsure as what our plans are. A quiet day at home in the AC, or a BIG family BBQ outside in the 110+ degree heat? I suppose we should hurry up and make a decision! I hope all of you have a fantastic holiday weekend. Be safe - drink lots of water and be sure to have a designated driver if you are drinking more than water. And don't forget your camera!!!!! Tuesday morning Monkey and I were playing and Mom handed her an empty card box to play with. I took it and laid one of her tiny Monkeys in it and told her it was a monkey bed. She played with it for a few minutes, kissing her monkey and then laying it in the box. This got my creative juices flowing and I called Bryanna at work. I asked her to bring me home one of the big paper boxes. So late last night (after America's Got Talent ended - do you watch that?) I took the box and started making a proper monkey bed. I cut the sides down making a 4 poster bed shape and then started painting. While the paint dried I got out the sewing machine and the scraps from her monkey quilt and monkey bag I made her. I made a little mattress and a couple of pillows, as well as a little monkey quilt. Once all of this was finished and the paint was dried I did a little bit of stamping on the bed. I was super happy with what I had made and couldn't wait till morning when my Monkey would arrive. I actually figured she would destroy the bed today as she played, but I was wrong. It surrived a full day of play! She carried it, pushed it, filled it with all manner of toys and even got into herself a few times. My little monkey bed was a big hit with my little Monkey today. After Bryanna saw my latest creation we had a very interesting discussion about "Stuff". I was explaining to her that I had made the bed out of just "Stuff" that I had around the house. That I had not bought anything special to make the monkey bed. She asked me how one goes about collecting "Stuff". She was worried that she would never be able to spontaneously make things with Monkey as she got older because she didn't own any "Stuff". I assured her that she did have "Stuff" and that as she got older, was married longer and was a mother longer that her collection of "Stuff" would grow. Our conversation ended with a simple request from my daughter. . .Bryanna wants a box of "Stuff" for Christmas this year. All of this got me thinking. I thought about all of the things I did with and made for my kids when they were young. We were so poor back then, that if I hadn't had my box of "Stuff" there would have been less fun memories together. longer, more boring summers, and no birthday parties. So, I started a mental list of things to put in her "Mom's Box O' Stuff". I came up with the typical things (things that some of which I am surprised she doesn't have) Glue, scissors, tape, contruction paper, needles, thread, pipe cleaners, yarn, paints and brushes. I would love to know what all of you have in your "Box O' Stuff". Leave me a comment here on my blog or shoot me off an email with the cool things you keep handy for those spontaineous creations. Well, I think it is time to say goodnight. I have Monkey all alone again tomorrow. And she is a busy little girl these days! Did I mention that she is officially walking now? All day today she walked everywhere. I hope to get some video of her tomorrow. OMGoodness - she is so stinkin' adorable and growing up so fast! Have a good night and a great Thurdsday!!!!!!! Who Says Mondays are a Drag? Not me! Anyways not this Monday! 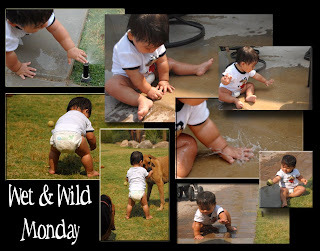 Monkey and I went out back this morning to get some fresh air and the sprinklers were running. Zsa Zsa (one of our dogs) was playing in teh sprinkler and having so much fun. It caught Monkey's attention and soon she was laughing that big belly laugh she has. I decided to let her down to touch the sprinkler, and that's all it took! Before long she was soaking wet and having the time of her life! Soon enough the timer went off and so did the sprinklers. She crawled out into the lawn and pounded on the grass, as if she could get the water to come back. Of course it wouldn't, so being a good Grammie I got the hose out for her. By the time she was done she was soaked (and so was Zsa Zsa). But they both dry so all was good! After playing in teh water outside, we had fun playing in the water inside - a bath with lots of toys. Then it was time to get dressed and have some good "dry" fun. A nap was attempted and failed so we went for a walk and a visit with a neighbor. Back home for grilled cheese sandwiches for us both and a lot more play! Our afternoon together was coming to an end, and it was time to take her to her Mom. We met at teh grocery store today, and even that was fun! Monkey got her very first tub of Hagen Das ice cream today. I even let her eat it in the store as we shopped. She LOVED it!!!! Well, Monkey may have gone home for the day but my fun didn't end. 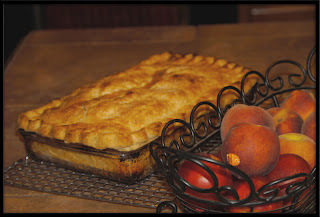 I made this HUGE fresh peach pie for myself tonight. I pulled it out of the oven at 11pm and dished myself up a big ol' piece. It was so hot and so yummy! And I plan on having another big piece for breakfast in the morning! The song says "Rainy days and Mondays always get me down" They obviously have not spent a Monday with my Monkey!!!! I hope all of you had a super special Monday too!